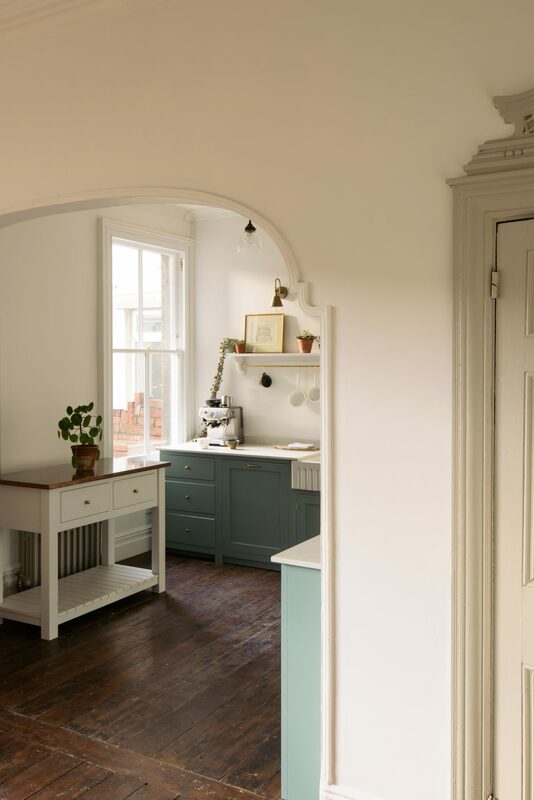 The cupboards in this deVOL Kitchen in Cardiff are all from our Real Shaker range. 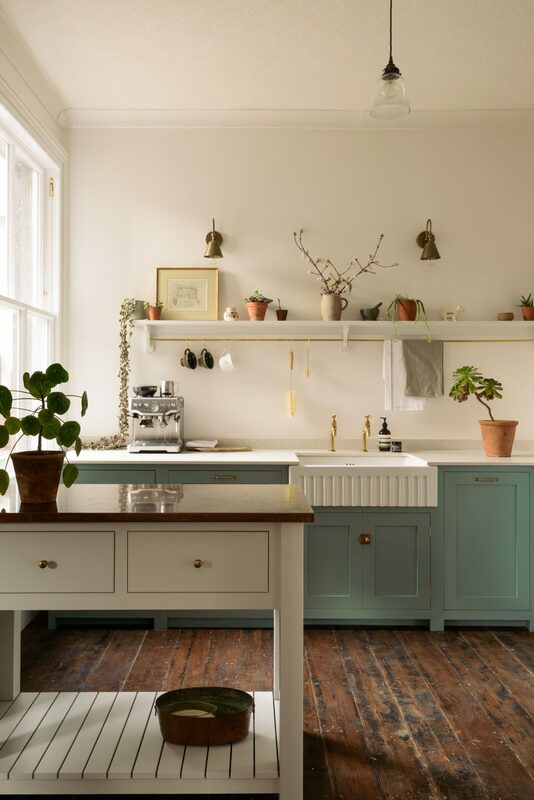 The little butcher’s block is painted in deVOL’s ‘Damask’ shade and ‘Trinity Blue’ has been used for the rest of the cupboards, this soft and very pretty paint is from our Shaker range, it’s subtle and calming and a little reminiscent of a kitchen from long ago. The customers chose ‘Wevet’ by Farrow & Ball as their wall colour, it’s a delicate white with a tiny touch of grey and worked perfectly with the cool undertones of the cupboard colours. The combination of colours here was an absolute triumph, we have some very clever customers! Oh and the hardware is from our ever-popular Bella Brass range, a mix of the catches, knobs and pulls. 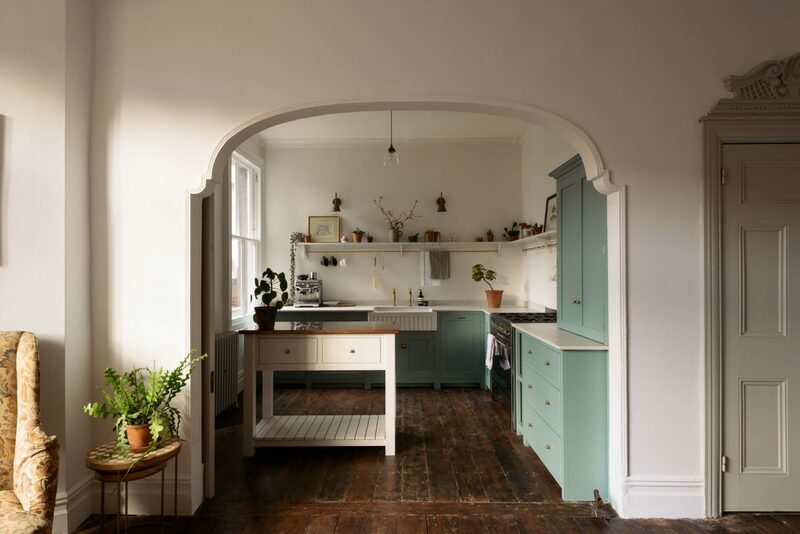 Big sash windows bathed this kitchen in the loveliest natural light. 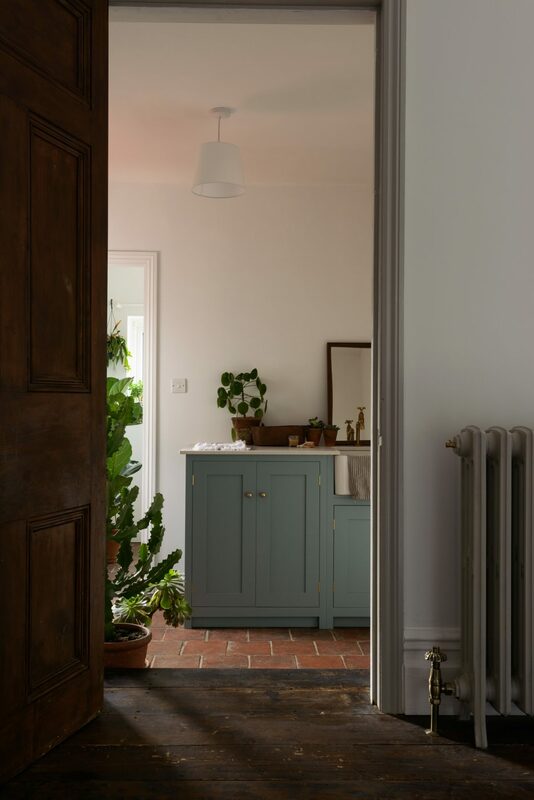 Here’s a peek into the little deVOL utility room and a great shot to show you both floors used in this project. 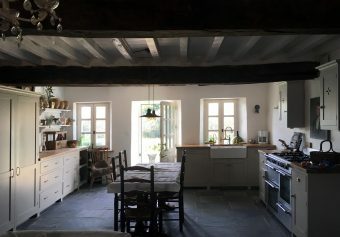 The wooden boards are reclaimed but you would never know, they look as if they could have always been there, all scuffed and so full of character. And then there’s the Terracotta Tiles from our sister company Floors of Stone, now we have spoken about our love for these warm, worn quarry tiles many times before, if laid carefully they are completely authentic and look good just about anywhere. If you’re lucky enough to have the space for a little utility room, go for it – a place to keep the messy jobs out of the kitchen! 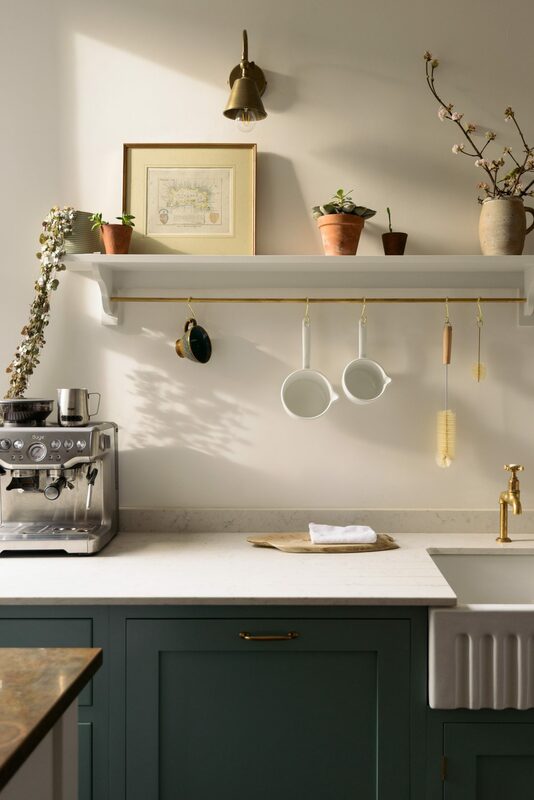 We love that the customers went for one of our deVOL 800 Fluted Sinks for the main kitchen, still very simple and traditional but the fluted front adds just a teeny hint of fanciness. 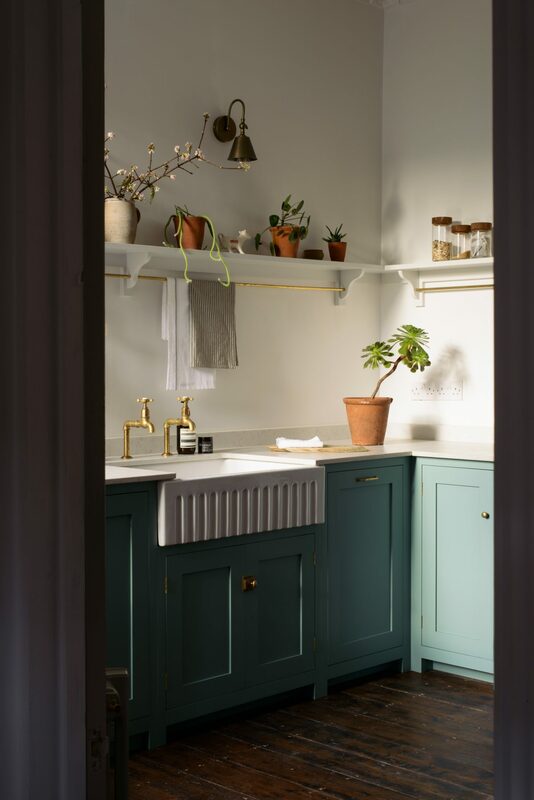 They kept it classic in the utility room with a Villeroy & Boch Farmhouse 60 sink, and each sink had a pair of our Aged Brass ‘Mayan’ taps too. The Mayan style means two separate taps, one for hot water and one for cold. If you’re after a pair of taps that look vintage but work like new, these are for you! Two very cool collaborations with two iconic British brands here – we made the sink with Shaws and the taps with Perrin & Rowe. It’s always cool to see our customers not only come to us for their cupboards, but for some of the little extra bits for their new kitchen too. One of the latest products to come out of the metal studio here at Cotes Mill is this Aged Brass Hanging Rail with matching ‘S’ Hooks. If you’re a keen cook or collector, open shelving, peg rails and hanging rails are always a good idea. Cooks need to grab a pan or ladle quickly and efficiently and this style of storage ensures everything is easy to find and easy to put away too. People who have a love of beautiful things also love to display them, why hide away all your treasures? 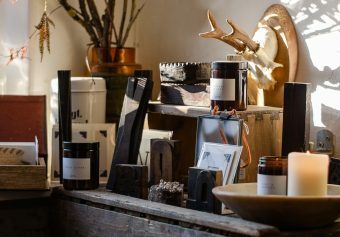 Whether it’s a collection of old French saucepans, straight rows of simple white plates and bowls, a few plants in terracotta pots or a jumbled mix of stuff, everyone’s displays are personal to them and there’s nothing better than a room with real personality. A shelf and brass hanging rail kept the room feeling light and airy and made the very most of the high ceilings. ‘Lagoon’ Silestone topped the perimeter cupboards and a piece of our bespoke aged copper topped the butcher’s block. Our copper worktops are all aged in-house by Steph using acidic substances like red wine vinegar. Not only is vinegar a natural ingredient and completely food safe, it also produces a very pretty and unique, mottled copper oxide patina. It’s not all about good looks with copper though, it also has rather special natural antimicrobial and antibacterial properties and has been used in kitchens (hospitals too!) for many, many years. There were so many pretty architectural features in this Edwardian Villa, just look at that archway! I love the lighting choices here. These customers were so confident in their own style that they didn’t need to make any statements with the lights. A couple of elegant glass ceiling lights by Rose & Gray, cool brass wall lights by Rockett St George and check out that lamp by the squishy velvet armchair, it’s from Soho Home. And I’m pretty sure the customers sourced that fabulous rug on eBay, what a find! 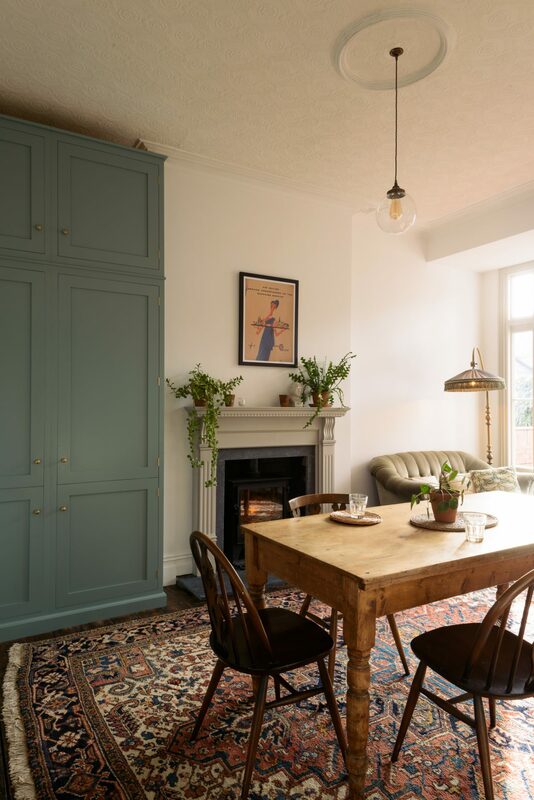 An original fireplace and lovely old table and chairs helped to make this room feel less ‘kitcheny’ and more like a living space. Now we didn’t get a clear shot of the appliances in this space but I know lots of you will be keen to know what the customers went for. You can just spot the range cooker on the right-hand side of this shot, it’s a Smeg range in stainless steel. A very well-made cooker that won’t let you down, our recommendation if you’re after something that is sturdy and good-looking but don’t want to totally splash out on something super high-end like a Wolf range! Behind the door to the left of the sink was an integrated Smeg dishwasher and the tall cupboard in the dining area (see above) housed an integrated fridge freezer, also by Smeg, and a roomy larder too. Having this large cupboard in the dining room not only linked the two spaces effortlessly but allowed the kitchen to stay uncluttered, light and airy. The transition from utility room to kitchen and then into the dining area is quite lovely in this house. Well I think that’s everything and I very much hope this has been helpful and given you a little inspiration! 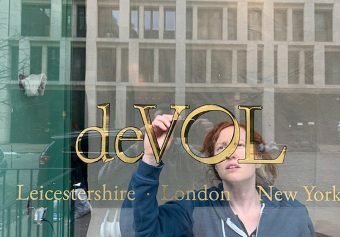 But as always, please do get in touch if you have any questions, we love hearing from you. – Check out the Edwardian Villa in Cardiff full project page here. – And don’t forget to follow us on social media! Instagram, Twitter, Facebook & Pinterest.